Have you got a low photographic hit rate? 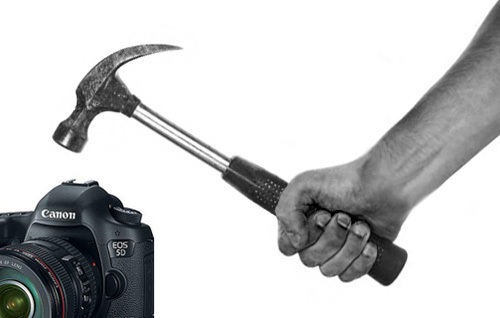 What’s your photographic hit rate? How many shots do you keep? The hit rate is something that we often artificially inflate. In fact it is common for learners to have a low hit rate. Knowing how to calculate it can help you understand your improvements. So what is the “hit rate” in mathematical terms? Simply put, it is the total successful shots divided by the total exposures for a given shoot. It is expressed as a percentage. You can see the full formula in the graphic below. • Hit Rate Calculation • What’s your hit rate? The math is simple, deciding what is relevant to your pick of successful photos from a shoot is a value judgement made on your expectations for the shoot or from a brief in the case of a shoot for a client. A more detailed look at the math, and the assumptions, can be found in “Photographic Hit Rate” in our Glossary pages. 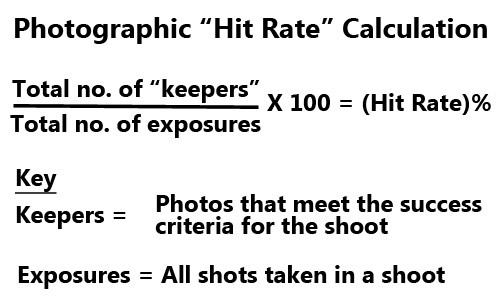 The examples there will help you to understand the meaning of “keeper” and how that relates to the hit rate percentage. The full mathematical explanation of hit rate really is as simple as the graphic suggests. However, it is important to understand that the whole calculation is based on a value judgement. What you pick as success criteria for your shoot determines how harshly you edit out or accept the successful pictures you choose for “keepers”. Of course you may keep most of your shots, but the really good ones you should call your keepers (actually I call my keepers picks… it’s your choice). My keepers, or picks, get separated out into a folder of their own for later use or for giving to the client. I keep the originals but I normally find I have a hit rate of around 25% to 35% depending on the shoot. Each shoot is different depending on the brief and the technical difficulty of the shots. You will have a low hit rate for the really fast action shots. You might have a higher number of keepers for the party and event shots for example. Of course he is right. Truly great shots come at a very low hit rate. However, we don’t have the luxury of only relying on twelve shots a year for most personal and professional purposes. How harsh should you be? When deciding on keepers you can decide to be as harsh or slack as you wish. What is important is your ultimate goal. If you want improvement your picks should be the very best shots. Each shot should be taken at a high standard and only the best should be published. I tend to think that learners should be quite harsh on themselves and work to exceed their own standards. You may want to set yourself a slower pace. It is your choice. Just make it fun. OK, this is the main point. If you are consistent over time in editing your shots you will begin to find you can push up your hit rate. Professionals tend to have a consistently higher hit rate than amateurs. After all they have to make a living from their shots. On the other hand if you keep tabs on the numbers you may find you are taking less shots because the ones you do take are returning more keepers as you improve. That saves time and especially editing energy. What measuring your hit rate does is give you a feel for improvements and consistency in your photography. Don’t ruthlessly measure everything. Look back over your shots. Get a feel for your hit rate. It will help you to get a picture of your success rate overall. I found that knowing my hit rate was a confidence booster when learning and an essential tool for my professional life. Give it a go. You might find it a great help too. This entry was posted in Background Info., How to..., Insights, Photography, Tips Tutorials & Techniques and tagged Approach, Calculation, Hit Rate, How it works, Keepers, Photographic Hit Rate, Understanding keepers, Vocabulary. Bookmark the permalink. Good advice! I am becoming tougher on myself in order to improve before I get a better camera. I find it is also helping to pick better shots to take.